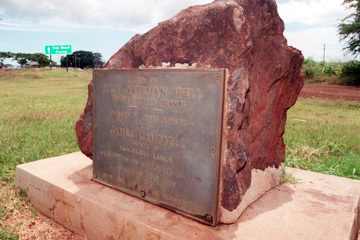 A plaque marks near where Hawaii's first artesian well was dug, in 1879, paving the way for irrigation on the Ewa Plain. Out in the Mad Max wilds of the Ewa approaches, on the great limestone cap-rock crust of the Leeward plain, Fort Weaver Road barrels on -- for several miles, straight as a teen abstainer -- into the Ewa Beach housing area. Don't blink or you'll miss it: a boulder beside the blacktop, seemingly misplaced in a dirt turnaround, with a bronze plaque attached. A Hawaii Visitors and Convention Bureau address for the site gives it as 760 Fort Weaver Road, an address that confuses not only visitors, but MapQuest as well. Just keep your eyes peeled for the rock, for it marks the event that changed the face of Oahu forever. The plaque reports it was here that the first artesian well in the islands was dug, in 1879, and it credits James Campbell for the innovation. It's somewhat true. Kinda. Sorta. Campbell didn't do the drilling himself. Like most captains of industry, he hired someone: skilled wild-catters James Ashley and James McCandless, guys who actually got their hands dirty puncturing the coral aquifer. Campbell was the big-picture guy. He envisioned farms on the dry, dusty plain. Irrigation began in 1890; by 1930, Ewa Plantation had drilled 70 artesian wells, clustered as pumping batteries, scattered about the Ewa Plain. And it all started right here, next to the road, in a dusty turnaround. Not so fast -- how picky are you about the word "site"? The rock and plaque have been moved at least a couple of times. The original-original site was in the middle of old Fort Weaver Road. The newer, straighter, improved road was built nearby and also named Fort Weaver Road. The original Fort Weaver Road, and the plaque, were abandoned. Then some no-goods pried the copper plaque off and melted it down for the recycling dough. Campbell Estate remade the plaque and moved the re-plaqued stone closer to the new highway. Got that? It's not only not the original spot, it's not the original plaque, either. But Campbell still got his water. » If they ban it, who will come? » Inside Hawaii Inc.: Patti Niemeyer of Maui Clothing Co.